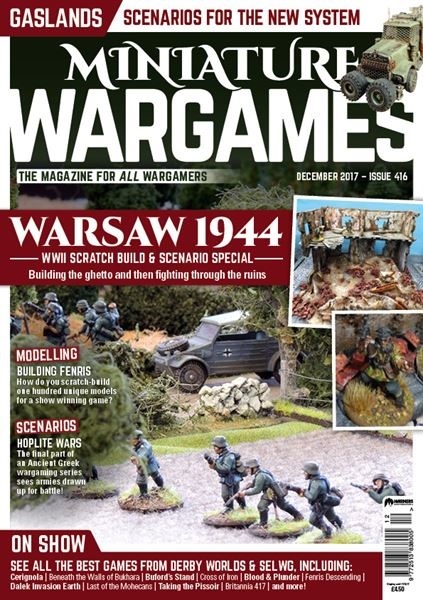 Issue 416 of Miniature Wargames is about to be released. What are the goodies on offer? The lead story this month is a double deal: Who would live in a house like this takes the scenery builder through the construction of a typical ruinous building in 28mm for use in eastern Europe with a multitude of period choices. Dave Tuck and Malc Johnston show wizard work with cork, foam board and dolls house furniture! To follow on from that is Street Fighting Man. Jim Webster shows how to take ruins – like the one in the previous article – and use them in a game (with some scenario outlines) for a WW2 Warsaw uprising. Gaslands: Keep the motor running and head out on the highway! Yes if you’re truly looking for adventure (and whatever comes your way) try these unique scenarios by the author of the latest Osprey rules release. In Send Three and Fourpence Conrad Kinch offers a personal guide to worthy YouTube locations for wargamers with some spare time on their hands or those, like the author, who are busy juggling babies and other demands on their time. Reinventing an Old Friend sees Jon Sutherland offering scenarios and army lists for his re-invented Ancients Hoplite rules in the final of a four part series. Shows: the editor takes a camera along to Derby Worlds and SELWG. Making scenery and whole armies! In Building Fenris Jeremy Claridge builds a host of robots from some fairly unexpected items for his award winning game and the Wargames Widow builds bridges to go with the river sections from last month. For reviews we have Fantasy Facts (with its sweep over non-historical gaming with releases from from Lucid Eye, Titan, Osprey, North Star, Ion Age, Skull & Crown and Brigade. 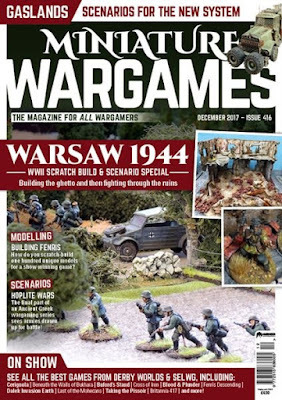 On the other hand, Forward Observer has (mostly) historical wargaming reports on Rubicon, Warlord, Deep Cut, Daemonscape, Stoessi and Victrix.. Finally we have Recce for a dozen book reviews and the free (small but still perfectly formed) Club Directory!